Are you ready for the weekend? Boy, I sure am!! 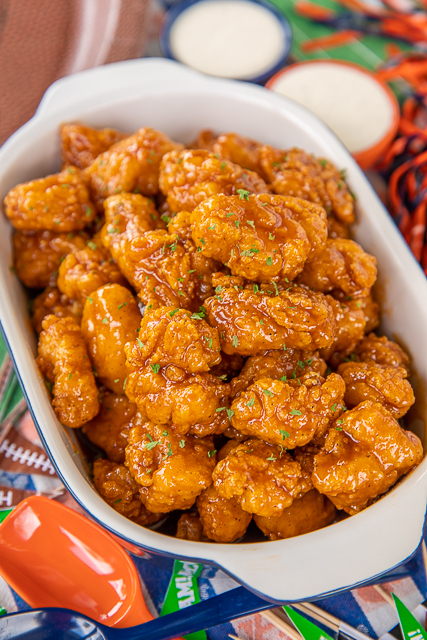 Bring on ALL the football and bring on these Sweet and Spicy Boneless Wings! O-M-YUM! 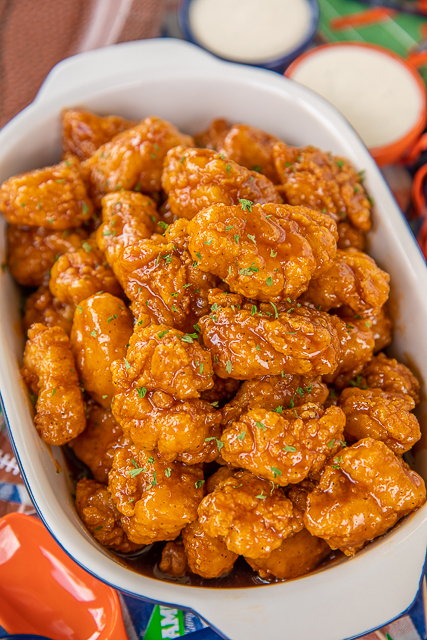 These Sweet & Spicy Boneless Wings were inspired by our favorite wings from Amelia Island. The hotel sports bar served wings with this type of sauce, and we just LOVED them! I finally got around to recreating them at home, and they are spot on! The sauce is combination of brown sugar and hot sauce. I used Frank's hot sauce. You can use any brand that you prefer. 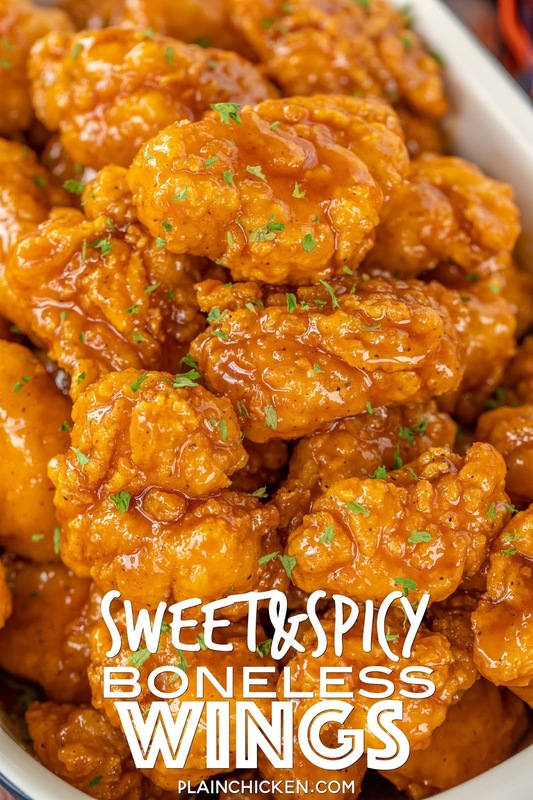 These Sweet & Spicy Boneless Wings aren't really spicy. There is just a hint of heat. 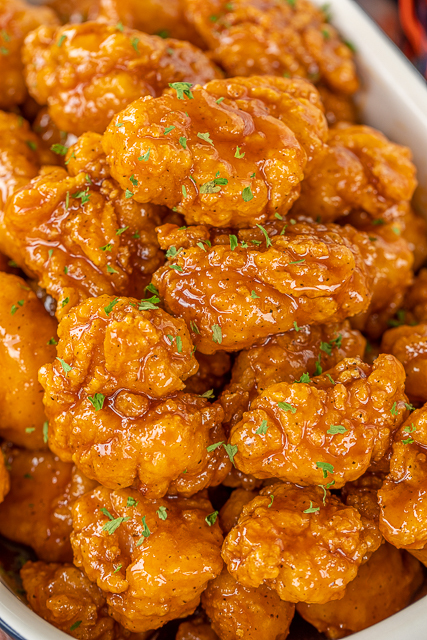 If you want hotter boneless wings, just increase the amount of hot sauce in the sauce mixture. I used frozen chicken for these Sweet & Spicy Boneless Wings. You can certainly make your own fried chicken or buy chicken nuggets from your favorite restaurant or grocery store. You could even use the sauce on bone-in wings. It is just your preference. I used frozen chicken nuggets because they are easier and less messy to eat at a football party. 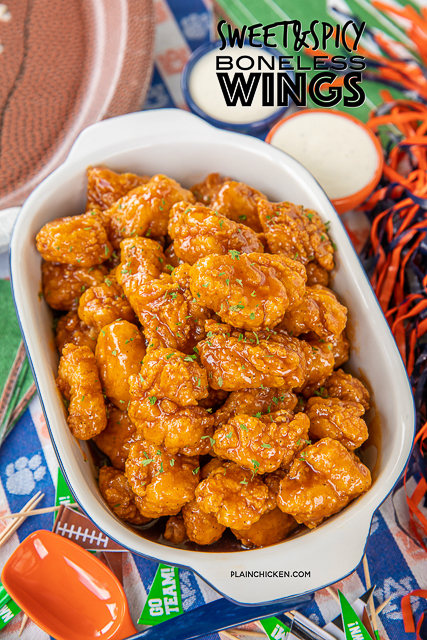 Serve these Sweet & Spicy Boneless Wings with some ranch or bleu cheese dressing and fries and your tailgate is guaranteed to score a touchdown! While chicken cooks, prepare sauce. In a saucepan over medium heat, combine brown sugar, hot sauce, water and butter. Cook until sugar has dissolved. Pour sauce over cooked chicken and toss to coat. Serve with ranch or bleu cheese dressing. Look great....which hot sauce and Nuggets? Brand makes a difference in flavor. I used Tyson chicken and Frank's Hot Sauce. Thanks! Give them a try this weekend! Okay, I wish you could have seen my mouth drop open when I was looking at these pics! These look crazy delicious! I love that these are boneless -- I hope the wing purists don't come for me, but boneless wings are the best in my book. And using frozen chicken is right up my alley. Thanks, Steph! Could the brown sugar be omitted to make them all spicy with no sweet, and still be ok?